Chicken Burgers with Feta and Sun-Dried Tomato are one of my favorite healthy recipes to throw on the grill. I'm living for these FETA AND SUN-DRIED TOMATO CHICKEN BURGER RECIPE! 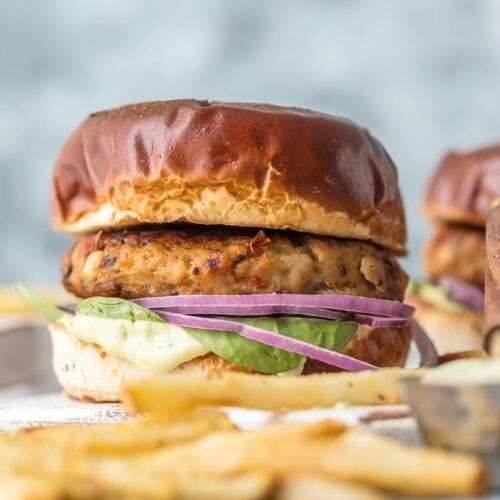 Make these Ground Chicken Burgers by grilling on the stovetop or outdoors once the weather cooperates for the ultimate good for you comfort food. The Mediterranean flavor combo on these sandwiches is out of this world, especially when topped with an easy pesto mayo. In a large mixing bowl, mix ground chicken, feta cheese, sun-dried tomatoes, basil, salt and pepper. Mix gently until ingredients are just combined. Divide into 4 equal portions and pat each portion into a 1-inch burger. Heat skillet over medium heat and add 1-2 tablespoons reserved packing oil from the tomatoes. Heat the oil until it sheens and set the burgers in the skillet. Cook until lightly seared on first side, 4 minutes. Flip the burgers and continue cooking until opposite side has a nice light sear, an additional 3-4 minutes. Flip the burgers over (again) and partially cover the skillet. Reduce the heat to low and cook until the burgers are cooked through and register 160°F when tested with a meat thermometer. While the burgers cook, mix the mayonnaise ingredients together, in a medium mixing bowl, and set aside. To serve, spread a thin layer of the Basil Mayonnaise on the inside of both halves of the buns. Place the burger on the bottom bun and top with burger garnishes of your choice. *For this recipe it is important to use ground chicken and not ground chicken breasts (which can be labeled 99% fat-free). The burgers won't be as moist. Ground Turkey also works well.